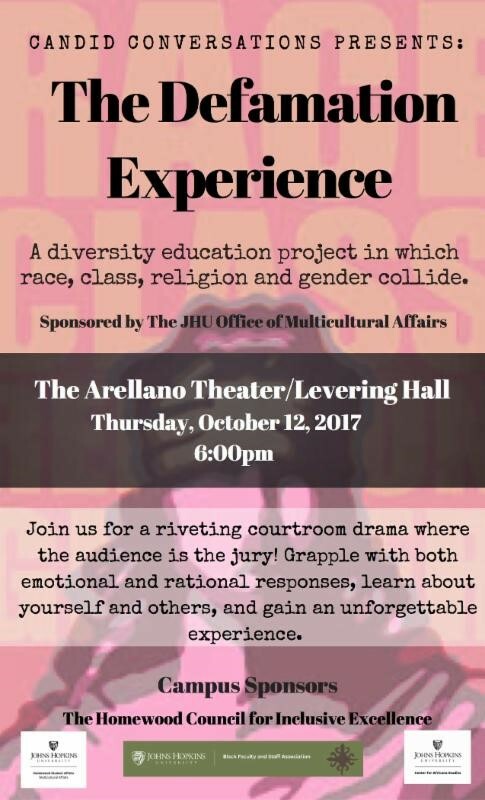 You are invited to attend “The Defamation Experience,” a diversity education project in which race, class, religion and gender collide. Encounter a riveting courtroom drama where the audience is the jury. Grapple with both emotional and rational responses, learn about yourself and others, and have an unforgettable experience. Join us tonight, October 12, 2017, from 6:00 pm – 8:00 pm in the Arellano Theater in Levering Hall on the Homewood campus. This event is sponsored by the Office of Multicultural Affairs. Additional campus sponsors include the Black Faculty & Staff Association, the Center for Africana Studies, and the Homewood Council on Inclusive Excellence.